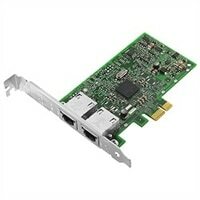 Dell Broadcom 5720 Dual Port 1Gigabit Network Interface Card Full HeightThe Gigabit Ethernet ® Network Interface Card from Dell™ is ideal for connecting your server to your network. The Gigabit Dual Port Server Adapter proven to be reliable and standards-based solutions. This product has been tested and validated on Dell systems. It is supported by Dell Technical Support when used with a Dell system. The Gigabit Ethernet ® Network Interface Card from Dell™ is ideal for connecting your server to your network. The Gigabit Dual Port Server Adapter proven to be reliable and standards-based solutions. This product has been tested and validated on Dell systems. It is supported by Dell Technical Support when used with a Dell system.